I confess that I didn’t understand this at first (typography jargon ‘n’ all) and it had to be explained to me. The commenter was talking about a drop cap where the text flows around the shape of the letter, rather than just around its bounding box, so the letter feels more like a part of the text and less like a separate entity. To see the difference, compare the two examples in Figure 1, “Simple drop cap versus complex drop cap”: on the left, the text flows in a square around the letter’s bounding-box; on the right, it takes a more complex shape around the letter itself. Thinking about this problem, I found myself recalling an instance when some text was made to flow around a non-rectangular image a few years ago. I felt inspired to play with the idea, and it turned out to be very easy to implement—if a little fiddly to make exactly right. 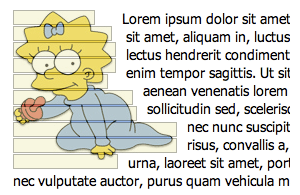 And you’ll end up with a paragraph that looks like the one in Figure 2, “Maggie Simpson flanked by miscellaneous text” (which is a good reason in itself, if you needed one!). You can also view this example online. Naturally the slices are transparent most of the time, so that all you see is the background image behind them. But if we style them instead so that they’re visible and separate, we’ll clearly see the mechanics involved in Figure 3, “The same image of Miss Simpson, now with visible slices”. You can view this example online too. So if that all works okay, could we use the same idea to implement a better drop cap? All we’d have to do is put a big positioned letter over a bunch of very small slices, which describe the letter’s shape, and we create the effect of text flowing around the letter. It’s exactly the same technique, just on a smaller scale. What we find, however, is that the resolution of the effect we’re creating—by which I mean how fluid the shape of the text becomes, and how closely it follows the contours of the letter—is determined not by the size of the slices, but by how many lines of text are affected. Essentially, the bigger we make the drop cap relative to the rest of the text, the greater the number of lines that are affected by it; this means that the text takes on the shape of the letter more clearly (just like having more pixels in a photograph). The example we saw at the very start, and now again here in Figure 4, “A large “L” preceding miscellaneous text that flows around it”, takes eight lines to wrap completely around the drop cap—and I think it looks great. However, you can see how we’d need a minimum of four or five lines to flow around that letter, or there’d be minimal effect at all; less than that is just too little to describe the shape of most capitals. That’s all it takes; no images are required. Since all the important sizes and dimensions are in em units, you only have to change the base font size on the container paragraph and it will all scale in proportion. One slight downside to this technique is that it now requires a wrapper around the first letter. The original technique used in this design takes the :first-letter pseudo-element to create the drop cap. However, that’s impossible for these examples, because current browsers simply don’t implement enough CSS properties for that pseudo-element to do the job (for example, positioning fails to work, and that’s crucial). 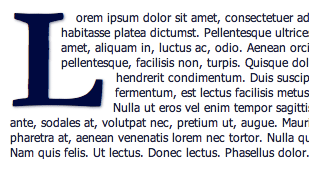 In any case, the presence of the slice elements before the text means that some browsers no longer consider it to be the first letter anymore. That’s why we have to use a wrapper. The other minor issue with this technique is that it doesn’t work properly in IE6, even though the basic trick does; the slices are out of proportion and out of position, and the surrounding text displacement is inaccurate. It might be possible to tweak it bit by bit with hacks until it’s right, but who has time for that stuff anymore! Apart from those two technical glitches, there’s also the inevitable question of whether you’re bothered by all those semantically superfluous span elements. There’s no way to avoid the need for them, as there just aren’t enough workable pseudo-elements to do this in CSS alone. Creating this effect comes at a cost then, and it’s up to you to decide whether it’s worth it for the end result.